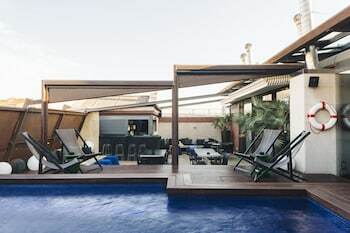 A stay at Hotel Granados 83 places you in the heart of Barcelona, within a 15-minute walk of Casa Batllo and Casa Mila. Featured amenities include a business center, limo/town car service, and express check-in. A roundtrip airport shuttle is provided for a surcharge (available 24 hours), and self parking (subject to charges) is available onsite. With a stay at this villa in Benissa (Benissa Coast), you'll be within a 10-minute drive of La Fossa Beach and Arenal-Bol Beach. Located in Calella, Esplai Hotel is within a 5-minute drive of St. Jaume Hospital and Calella Beach. Featured amenities include a 24-hour front desk, luggage storage, and an elevator (lift). When you stay at Gulet Why Not - All Inclusive in San Bartolome de Tirajana, you'll be within a 10-minute drive of Meloneras Beach and Maspalomas Botanical Garden.